Currently browsing posts filed under "Stephen Sondheim ’50"
Can someone explain the joke to me? I honestly don’t get it. “American composer and lyricist Stephen Sondheim is to receive the prestigious Special Award at the Laurence Olivier Awards later this month. The honour is being presented in recognition of his contribution to London theatre, organisers have said. Enjoy! This could be the greatest interview ever in journalism and, Go Williams. Does it sound like the sea? The more precise, and concise, a lyric, the more likely it is to liberate the ideas behind it. “I think the more restrictive, the freer it is. It’s always been true. If you’re locked in a room, you explore all the corners.” Of course, he says, “Tolstoy might disagree. There are people who like to over-write, and who are effective at over-writing. Particularly the Russians.” He points to Hammerstein’s lyrics, which at their best illustrate how something ordinary on the page can be transformed in performance. “‘Oh what a beautiful morning / oh what a beautiful day.’ Nothing could be more banal,” Sondheim says. “But that song changed the history of musical theatre.” And it did so through simplicity, clarity and repetition. Comments Off on Does it sound like the sea? Congrats to John Morris Russell ’82, new conductor of the Cincinnati Pops. [Update, I drafted this before Eric’s comprehensive post on-point]. Great feature on Nick Zammuto ’99 of The Books, including a description of a (presumably Winter Study) class he taught at Williams. Nice article about and review of a recent Darlingside show. Check out a live performance from this show as well (also pasted below). For D.C. Ephs, you can see Darlingside perform in the up-and-coming H Street N.E. area tonight at 10:30ish. I hope to be there (if I can stay awake), so if you attend, say hello; I am 6’3 and devastatingly handsome, so I should be hard to miss. To get you in the mood for the holiday season (yes, Fox News, I said holiday, not Christmas, I realize how anti-American that makes me), check out the new YouTube page for the Williams Gospel Choir. Effusive article on Stephen Sondheim ’50’s influence on the evolution of musicals. In case you missed it, a recent post from Eric on Marcus Hummon ’84. ALL THE DEVILS ARE HERE: The Hidden History of the Financial Crisis. By Bethany McLean and Joe Nocera. (Portfolio/Penguin, $32.95.) More than offering a backward look, this account of the disaster of 2008 helps explain today’s troubling headlines and might help predict tomorrow’s. CLEOPATRA: A Life. By Stacy Schiff. (Little, Brown, $29.99.) It’s dizzying to contemplate the ancient thicket of personalities and propaganda Schiff penetrates to show the Macedonian-Egyptian queen in all her ambition, audacity and formidable intelligence. FINISHING THE HAT: Collected Lyrics (1954-1981) With Attendant Comments, Principles, Heresies, Grudges, Whines and Anecdotes. By Stephen Sondheim. (Knopf, $39.95.) Sondheim’s analysis of his songs and those of others is both stinging and insightful. Do any Ephblog readers have recommended favorites from the NYTimes list (or, for that matter, other great reads for the holiday season)? I absolutely loved One Day by David Nicholls, and I am not generally one for romantic stories … very cleverly constructed novel. My favorite recent fiction book not featured on this list (and it was released in hardcover last year, but the paperback came out in 2010, so I’m counting it), was Lev Grossman’s The Magicians. Sort of a Harry Potter for adults, but that description doesn’t do it justice. A really fun, quick read that you can’t put down once you are five pages in. Speaking of literary Ephs, English Professor Jim Shepard’s’ latest story, Boys Town, was featured in a recent New Yorker. Shepard was also interviewed regarding this story here. Also keep an eye out for Carrie Ryan ’00’s forthcoming The Dark and Hollow Places. Updated with Carrie Ryan’s correct year. Also, here is a link to a running list of books published by Ephs. Finally, here is an article (subscribers only, alas) about Caragh O’Brien, author of Birthmarked, and who along with Ryan may be the first two members of the Eph Post-Apocalyptic Dystopian Teen Novelist Mafia. The word is out that the new HBO series, The Miraculous Year, is based on Stephen Sondheim ’50, and the gossip pages are buzzing. Terry Segal lives in an elegant townhouse; Sondheim has a gorgeous brownstone in Turtle Bay. Terry’s gay, as is Sondheim. Terry writes sophisticated shows that please the critics but fail at the box office. “Follies” anyone? “Sweeney Todd”? “Sunday in the Park With George”? “Passion”?? Terry drinks a lot; Sondheim once told the Times, “I have a large capacity for alcohol.” A few years ago, I saw him polish off a bottle of Chardonnay — Kistler, if I remember correctly — during the intermission of “Follies” at City Center. His young boyfriend gently guided him across the street for the second act. Terry also does cocaine, as did Sondheim in the ’70s, which he told his biographer, Meryle Secrest. And at the end of the pilot, Terry, who’s 44, has a heart attack. So did Sondheim, in 1979, when he was 49. Read the whole thing for details about Sondheim’s demands for changes in the script. The Miraculous Year is being directed by Kathryn Bigelow and will reportedly star Susan Sarandon and Frank Langella. HBO expects it to be released sometime next year. Sondheim held back tears during a college event Saturday night in Chapin Hall, as he talked about the influence his alma mater had on his decision to become a composer and lyricist in the American theater. “Williams changed my life,” the 1950 graduate said. 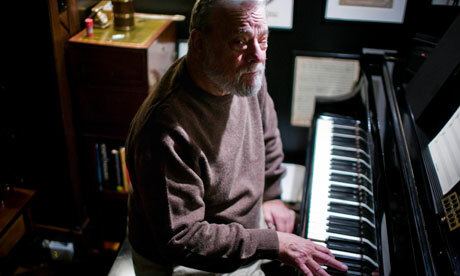 Sondheim, who began at the college as an English major, spoke about taking classes taught by Robert Barrow, who was a music professor at the time. “He did something revolutionary. He took the romance out of music,” Sondheim said. Barrow taught that everything was about how music works and how it’s an art, he said. Around the same time Sondheim was taking his first class with Barrow, he also took an art class in which the professor taught how art was a structured and conscious effort. 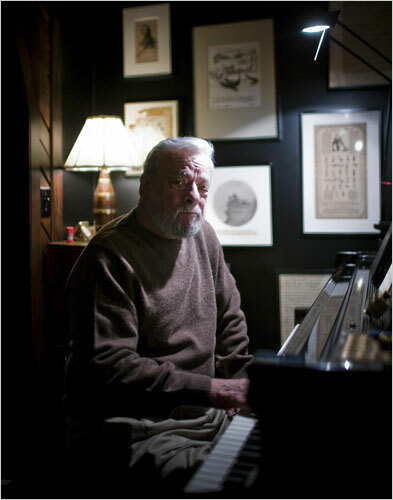 “Since I have a puzzle mind, it hit me at the right time,” Sondheim said. The New York Times ran a long piece on Stephen Sondheim revival fever this week. I keep waiting for Jason Howland ’93, whose show Little Women made it to Broadway but who has since been relatively quiet, to follow in Sondheim’s enormous footsteps. Howland wrote and produced two AMAZING musicals while an undergrad at Williams. Supremely talented guy. EphBlog is powered by WordPress and delivered to you in 1.384 seconds using 36 queries..